Alvanley Accounting Company/Firm, RC Financial Group specializes in Accounting, Taxation, Investments, Business Consulting, Commodities Trading, US Taxation and IRS Representation. We are here to assist you with your personal accounting, small business accounting and other finance needs. Accounting is detail oriented and does not leave room for error. We at RC Financial Group understand the value of money and realize that a dollar today is worth more than a dollar tomorrow. Our specialized team of licensed Chartered Accountants (CA), Chartered Professional Accountant (CPA) and Certified Management Accountant (CMA) have your companies’ best interest in mind. We want to help you achieve your financial goals. We understand the importance of financial Statements and how their figures impact your daily operations. We strive for perfection and work with compliance of Canada Revenue Agency, Service Ontario and the Government of Canada Services. Alvanley RC Financial Group offers onsite and offsite bookkeeping services as well as training/services in Quick Books. We are also knowledgeable in financial audits. Our Accountants believe that auditing is a vital part of accounting. We assist businesses in understanding audits and their purpose. RC Financial Group places a strong emphasis on ensuring that our staff adheres to generally accepted financial reporting standards placed by the governing body of that region such as Accounting Standards for Private Enterprise (ASPE), International Financial Reporting Standards (IFRS). Our audit services can assist with dealings with investors, partners and banks. At Alvanley RC Financial Group we offer Personal and Corporate Income Taxes, Corporate and International tax services. We understand taxes can sometimes get costly; our mission is to assist you in minimizing taxes. Our team of Accountants and investment advisors can offer advice and suggest tips that can aide in minimizing taxes; such as Registered Retired Saving Plan (RRSP) and contributions and Tax Sheltering Savings Accounts (TFSA). 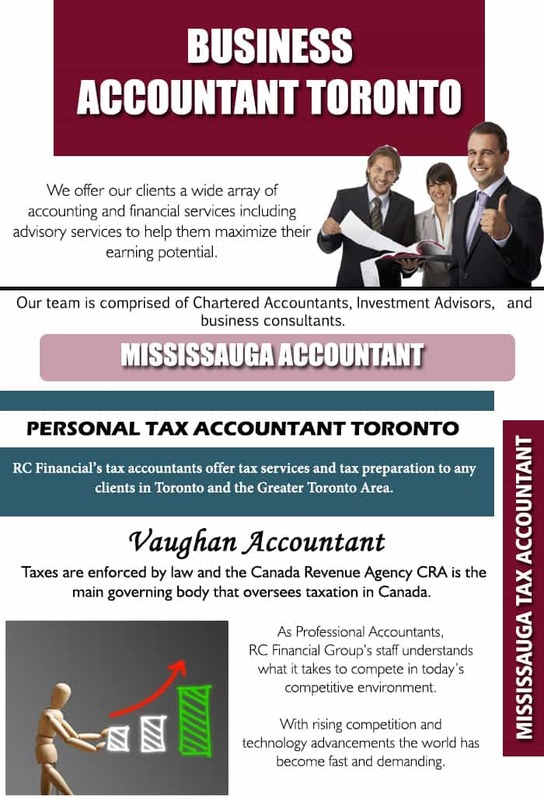 Alvanley Accounting Company RC Financial group also offer payroll services with CRA Remittance, If the need arise or if you require CRA representation due to any kind of accounting or tax matters. We offer tax consulting and guide you to through the necessary processes involved to resolve any kind of matters. RC Financial Group can aid you in difficult, complicated tax problems with arrear taxes owing or any other kind of tax issues that arise. RC Financial Group also offers review of engagement for businesses we offer timely delivery of reviews and meet the requirement and needs of our clients. Alvanley Accounting Company,RC Financial Group offers business consulting for businesses looking to expand and need an accountant to help guide them with the processes involved for making the right decisions at the right time financially. We specialize in financial report writing and employ accounting tools to help our clients prosper financially. We specialize in start-up businesses looking to get their operations in line with their mission mandate and help them execute the best possible model for their business. Alvanley Accounting Firm RC Financial Group offers auditing for its clients locally and internationally our team of qualified Accountants travel on site to service our clientele all around the globe. Auditing is an essential accounting tool which aids the client ensure that their business is running smoothly and does not lack any operational efficiencies and ensures the financial viability of the long term growth of business. Alvanley RC Financial Group offers business consulting using marketing strategies , IT services, Financial Statement Analysis, Risk Management, Fraud Detection, startup assistance, internal records analysis, Benchmarking, business valuation, forensic accounting. Since we understand numbers and have the ability to forecast challenges that affect your business growth.